1. In a medium saucepan, bring the sugar, honey and water to a boil over high heat, stirring until the sugar dissolves. Reduce the heat to medium and stir in the cranberries. Cook, stirring occasionally, until the berries start to pop. Remove from the heat and stir in the orange juice. Pour into a heatproof bowl and refrigerate for several hours until cold. 2. Blend the flour, sugar and salt in a food processor. Add the butter, pulsing until the mixture resembles coarse crumbs. Add the ice water and blend until the mixture comes together. If it seems too dry add more ice water a teaspoon at a time. Transfer to a lightly floured surface. Knead the hazelnuts into the dough. Press into a 9” tart pan with a removable bottom. Freeze for 20 minutes. Heat oven to 375◦. Line the crust with foil, fill with dried beans or pie weights. Bake 15 minutes. Remove the foil and beans. Bake until the crust is golden, piercing with a fork if the crust bubbles. Cool completely. 3. Beat the cream cheese, sugar, lime juice and peel until fluffy. Beat the whipping cream in a medium bowl until stiff peaks form. Fold into the cream cheese mixture. Spoon the mixture into the crust and smooth the top. Refrigerate until firm, at least 2 hours. 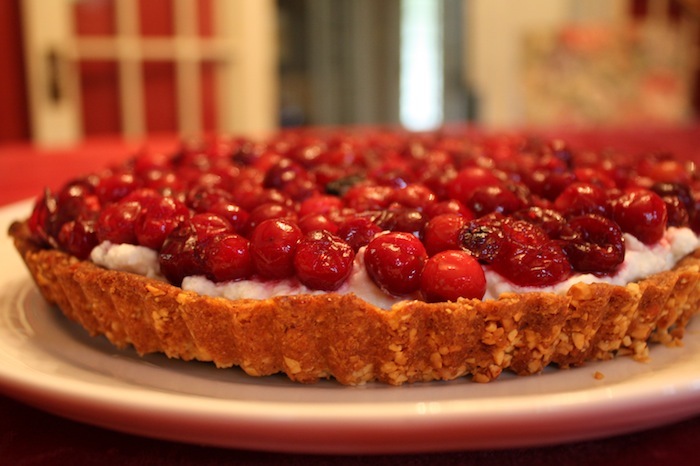 Use a slotted spoon to scoop the cranberries out of the syrup and let drain briefly before spooning them on to the tart. Refrigerate until ready to serve.